You know that shiny glow you see on models in magazines? Their legs are super shiny and arms look super smooth and everything looks flawless and silky? Yeah that’s not real. You can thank Photoshop for that. But if you do want the smoothest and softest skin possible, you have to take steps to care for it. Body washes and loofahs help, but every once in a while you need a special treatment to really slough off the dead stuff and really hydrate the skin. 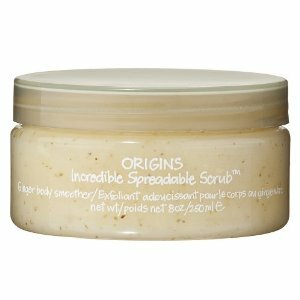 That’s where body scrubs come in, and my favorite is by Origins called the Incredible Spreadable Scrub. It’s made with Dead Sea salt, olive oil and a bunch of other great things for your skin and has a light, warm scent of ginger. The scrub really buffs away at dull areas and leaves radiant and moisturized skin behind. When I used to live up north, the long winters would really dry out my skin but this gingery scrub fixed everything. Now that I’ve moved to a warmer climate, I still use it, especially for dressy occasions. I love the scent and how buttery soft my skin feels after using it. Your skin might not be able look like the models’ in magazines, but this scrub helps you get pretty damn close.